Eliminate unwanted odours from fabrics in an effective AND a safe way? It is now possible to combine effective and safe with the brand new ATTITUDE Fabric Refreshers. 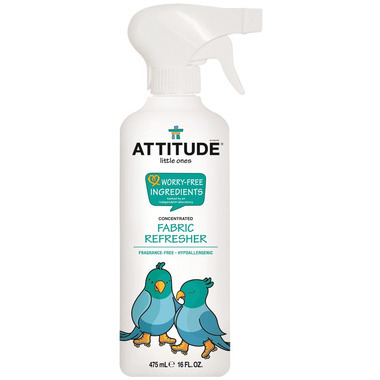 Without harsh chemicals and carcinogens found in other brands, ATTITUDE is the ideal solution to eliminate unwanted odours while staying safe for all family members. I like this product. I've sprayed it on window curtains that can't be removed and washed, on our duvet cover and decorative pillows, and on clothes in our seasonal closet. Love this stuff. My husband uses it on his hockey gear - and it works. That is a true testament of its effectiveness! I get headaches from room and fabric refreshes, and scented candles for that matter, this product is great for freshening up upholstery and shoes without a harsh scent.